In a case that exemplifies Robbins Geller’s unmatched commitment to its clients, plaintiffs recently prevailed in a long-running employment class-action lawsuit stemming from the misclassification of insurance claims adjusters in California. Plaintiffs, seven former claims adjusters at Liberty Mutual Insurance Company and several of its subsidiaries, sought the recovery of unpaid overtime compensation and penalties. At the end of 13 years of complex, exhaustive and contentious litigation, which included 6 years of appellate litigation, Robbins Geller, together with its co-counsel, secured a settlement in which Liberty Mutual agreed to pay $65 million into a fund to compensate over 1,600 current and former claims adjusters for unpaid overtime. In May 2004, the trial court granted plaintiffs’ motion for class certification and appointed three firms, including Robbins Geller, to represent the class. 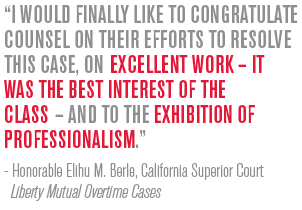 After completing discovery in early 2005, plaintiffs moved for summary adjudication on defendants’ affirmative defense that plaintiffs and class members were exempt from overtime pay under California law. Defendants countered with a motion to decertify the class and two motions for summary judgment. On October 18, 2006, the trial court issued a decision granting in part and denying in part defendants’ motion to decertify and denying plaintiffs’ motion for summary adjudication on the liability issue. The battleground then shifted to the appellate courts. Over the next six years, the case generated two separate decisions by the California Court of Appeal and an intervening decision from the California Supreme Court. On August 16, 2007, the Court of Appeal issued its first decision, granting plaintiffs’ motion for summary adjudication and denying defendants’ motion to decertify the class. After granting defendants’ petition for review, on December 29, 2011, the California Supreme Court found that the Court of Appeal had applied the wrong legal standard and remanded the case to the Court of Appeal for further proceedings. Plaintiffs nevertheless pressed on. When the case returned to the Court of Appeal, Robbins Geller attorneys briefed the liability and class certification issues in light of the California Supreme Court’s decision. On July 23, 2012, the Court of Appeal again ruled in plaintiffs’ favor. In that ruling, the Court of Appeal found that defendants were liable for unpaid overtime. The court also found that the trial court had erred in decertifying the class. Defendants promptly sought review by the California Supreme Court, but the court declined to hear their petition, leaving intact plaintiffs’ complete victory at the Court of Appeal. Two months later, the case was returned to the trial court. Even after losing the appeal, defendants continued to mount an aggressive defense, arguing in a motion to the trial court that the Court of Appeal’s decision was not binding on the trial court. Before defendants’ motion could be resolved, however, and after a full-day mediation session, in June 2013, the parties agreed to resolve all claims in exchange for a $65 million payment from Liberty Mutual. With no objections from class members, the court granted final approval of the settlement in June 2014, calling it an “excellent result” for the class. The size of the recovery is particularly noteworthy since it comes at a time when virtually every other court over the past ten years has decided similar cases involving the misclassification of insurance claims adjusters in favor of the defendants. Average settlement checks for overtime claims are estimated to be $28,355, with several class members expected to receive nearly $100,000. “This is a solid victory for claims adjusters in California,” said Theodore J. Pintar, who worked on the case from its inception. Robbins Geller attorneys Theodore J. Pintar, Patrick J. Coughlin, Steven W. Pepich, and Steven M. Jodlowski were responsible for obtaining this settlement on behalf of the plaintiffs. Liberty Mutual Overtime Cases, JCCP No. 4234 (Cal. Super. Ct., Los Angeles Cty. ).